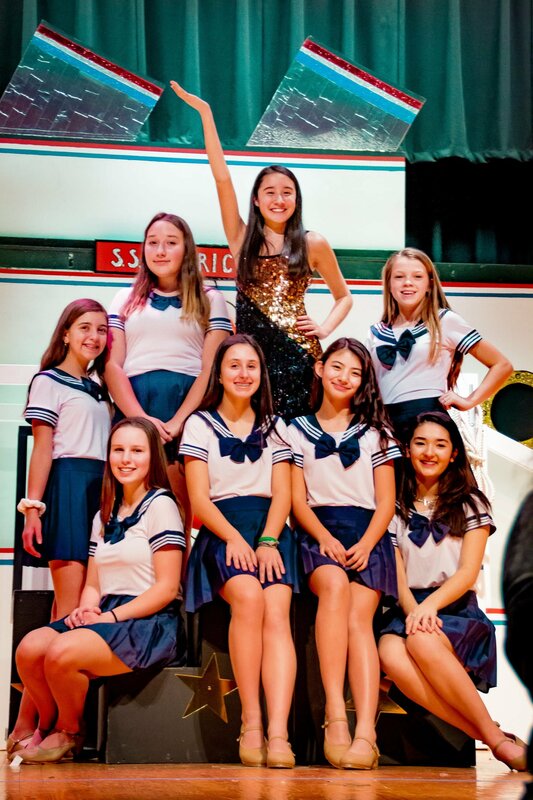 Climb aboard for the annual spring musical, Anything Goes with music by Cole Porter, at Central Middle School to be performed on Friday, March 22 and Saturday March 23. The cast and crew have been hard at work for months, learning dances, memorizing lines and building the sets. The production is directed and produced by Rebecca Lipschutz and Brian Maher, with choreography by Julia Magglio. Anything Goes is set aboard the ocean liner S. S. American, where nightclub singer/evangelist Reno Sweeney is en route from New York to England. Her pal Billy Crocker has stowed away to be near his love, Hope Harcourt, but the problem is Hope is engaged to the wealthy Lord Evelyn Oakleigh. Joining this love triangle on board the luxury liner are Public Enemy #13, Moonface Martin and his sidekick-in-crime Bonnie. With the help of some elaborate disguises, tap-dancing sailors and good old-fashioned blackmail, Reno and Martin join forces to help Billy in his quest to win Hope’s heart. Tickets are available online. General Admission: $15.00. Student Ticket: $10.00. Running time is approximately 2 house with a 15 minute intermission. The cast includes Stella Frankel as Reno Sweeney, Sean Cowie as Billy Crocker, Angelica Marin as Hope Harcourt, Jack Glass as Moonface Martin, Aaron Cohen as Sir Evelyn Oakleigh, Francie McKenzie as Bonnie, Mickey Tolentino as Elisha J. Whitney, Emma Wilson as Connie, Maya Chattoraj as Mrs. Wadsworth T. Harcourt, Harry Manion as Bishop Henry T. Dobson, Chris Munoz as Captain, Laura Da Costa Locatelli as Steward, Emma Kunschner as Reporter, Erik Sosa as Camerman, Ella Piu as Luke, Veronicz Ruiz as John, Katie Coyle as Purser. Martina Fuster as Chastity, Lola Dellascenza as Purity, Paige Goldring as Virtue, Amelia Hamlen as Charity, Madeline Minichetti as Joy, Lucie Cahill as Glory, Grace Nash Rapture, Tela Augyte as Merry. Sailors include Sebastien Passemart as Martin Fomin, Robbie Silverstein as Christopher Crooks. Passengers include Jake Lockwood, Leen Alarjawi, Evan Kostin, Estelle Alexander, Emily Lewis, Ana Aviles, Erin McKay, Justin Bernstein, Talia Muir, Anne Bologna, Sofia Munoz, Xaris Cifuentes, Lena Natale, Ethan Cooper, Maria Ribeiro, Kathryn Curtin, Avery Riddle, Maddie Febles, Alina Sarkissian, Averi Geary, Helen Schwartz, Linsday Geary, Sarah Tocci, Amalie Harpoth, Natalia Toczydlowska, Beatrice Healy, Leia Wilson, Olivia Hirsch, Mollie Wood, David Gooley, and Kristin Koellmer. Tony Award winning Director and Choreographer of the 2011 Broadway Revival of "Anything Goes" Kathleen Marshall paid a visit to Greenwich High School on Wednesday, as the cast and crew of the spring musical had their final dress rehearsal before opening night.